Enjoy an authentic outback experience on a 6 day, 5 night all inclusive tour. 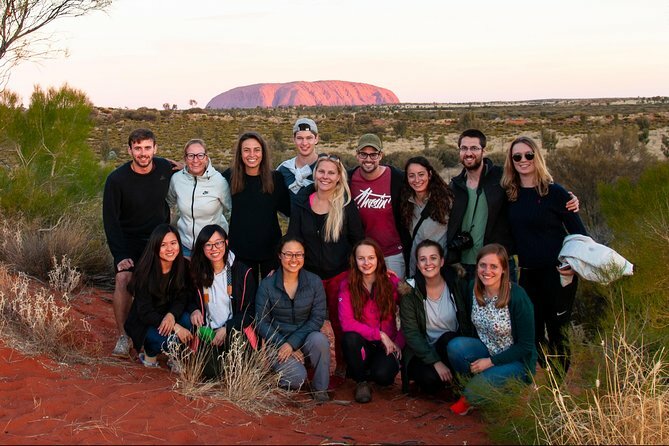 From Adelaide to Alice Springs, walk through the Flinders Ranges, visit an opal mine and a Kangaroo Orphanage in Coober Pedy, appreciate the sunset over Uluru (Ayers Rock) and sunrise over Kata-Tjuta (The Olgas), walk through Watarrka National Park (Kings Canyon) and experience much more! Hand feed rescued baby joey's. Explore indigenous art work. Sunrise over Uluru, Kata Tjuta Valley of the Winds Hike. No accommodation included on this day. The tour included a lot of nice experience. Walking in Kings Canyon , at Kata Tjuta and Uluru was all awesome, but also a bit hard. Be advised to bring good hiking shoes and clothes. + headlight and warm outfitt because the night get cold. If you cancel at least 7 day(s) in advance of the scheduled departure, there is no cancellation fee. If you cancel between 3 and 6 day(s) in advance of the scheduled departure, there is a 50 percent cancellation fee. Groovy Grape Tours caters especially for the youth, adventure traveller and backpacker who want fun, informative, adventurous trips. We are not restrictive of age, but we do require our travellers to be young or young at heart, with a reasonable level of fitness. The Ayers Rock Resort has a swimming pool, wi-fi, shopping centre, bank and laundry facilities. We may adapt our hikes in Watarrka NP (King’s Canyon) if it’s too hot.